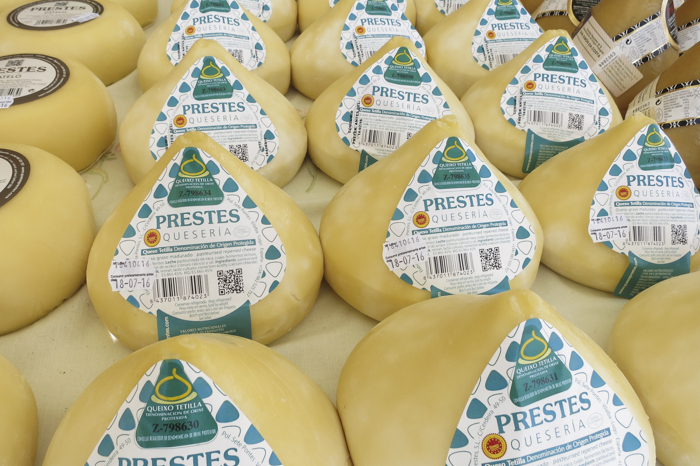 This cheese comes from the northwest corner of Spain, where the mountains meet the sea. Surprisingly, cow milk cheese in Spain is not common due in part to the rough mountains and dry plateaus. 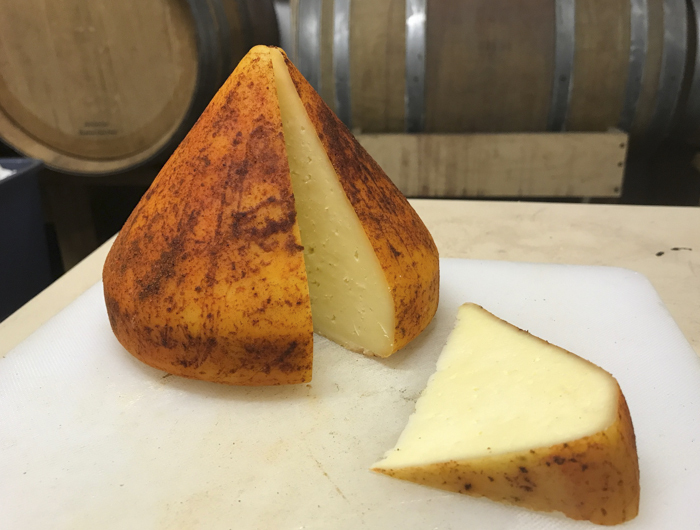 On a recent trip to Spain, Tetilla cheese stood out with its freshness and unique shape of a flattened tear drop. It is a wonderful high to medium moisture cheese with a sweet buttery flavor. In this recipe, we even added our own finish with a smoked paprika and oil rub, yum. This cheese is easy to make but it does have several steps, including a cold water curd wash which is fun to try out. If you've already made a few different types of cheese this is a great cheese to make. We do suggest reading through this recipe a few items before you begin so that your ready for each step. Once the milk is at 88F the culture can be added. My preferred culture is our MA4002 (about 1/8 tsp) because this is a blend of a mesophilic that produces a little CO2. If you already have C101 mesophilic culture packs 1/2-3/4tsp can be used but the result will be slightly less complex. You may be thinking theses culture amounts are light and they are, that's what you want. 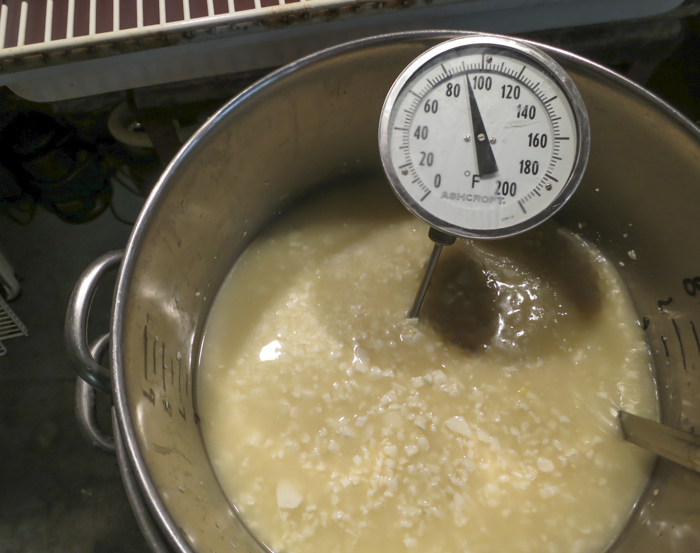 The milk now needs to be kept at this target temperature (88F) until it is time to increase for cooking the curds. Hold the milk with culture quiet for the next 60 minutes to allow the culture to begin doing its work. It will be very slow initially but will soon kick into its more rapid rate of converting lactose to lactic acid. Then add about 1/4tsp or 1.25ml of single strength liquid rennet in about 1/4 cup of water and stir this in slowly for about 1-2 min. 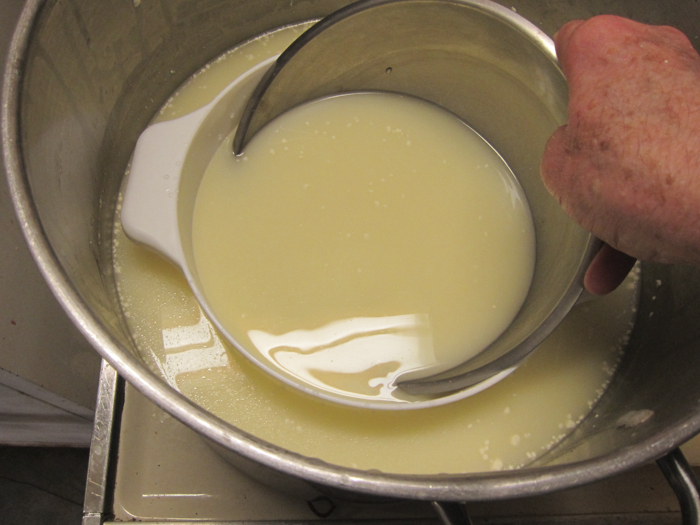 The milk now needs to sit quiet for about 45 minutes while the culture works and the rennet coagulates the curd. You should notice the surface of the milk thickening at about 15 minutes but leave the curd to develop its full firmness. 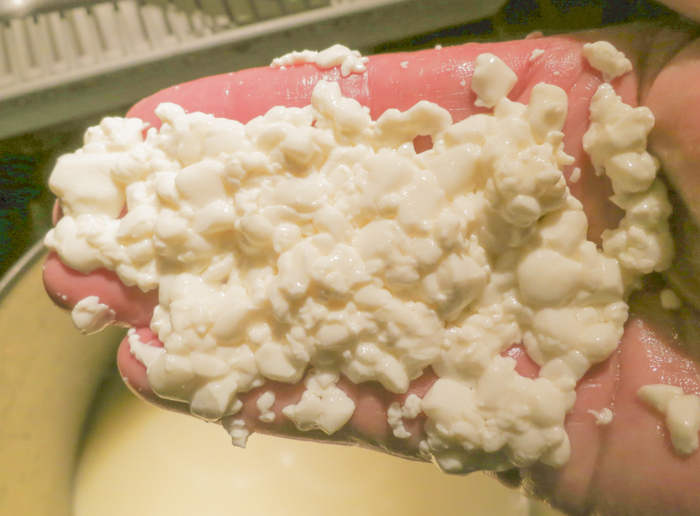 This longer set will tend to incorporate more moisture into the final curds. The thermal mass of this milk should keep it warm during this period. 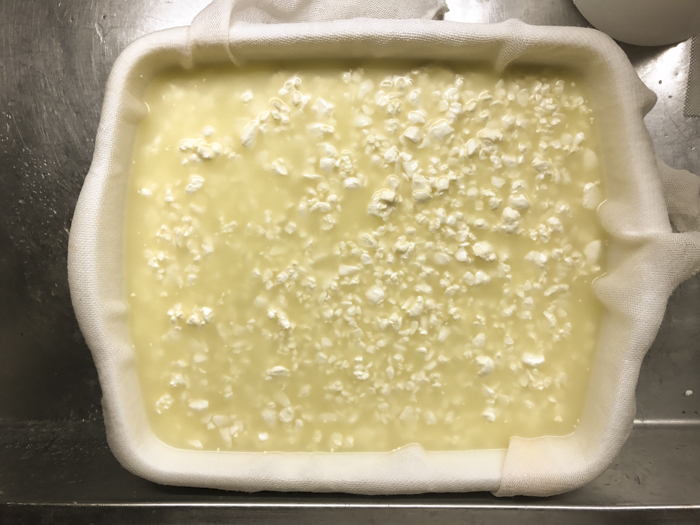 It is OK if the temp drops a few degrees during this time..
Once a firm curd has formed (make sure you check the firmness) it is time to cut it in preparation for whey to drain off. The final cut for the curds will be about 1/2-58". Begin the cut by making vertical parallel cuts slightly wider than this measure over the entire surface and then again at right angles. Then rest for 5 minutes while these heal along the cuts surface. Whey should be seen rising in the cuts when ready for the horizontal cut. Next using a slotted spoon or ladle bent at right angles, cut horizontal throughout the vat trying to cut about the same dimension as the previous two cuts. I know its not easy but do your best and make sure you get into the corners. When you think you have that, Stop and rest again 5 min. for the new cuts to heal. You are now ready to begin S-l-o-w-l-y but steadily stirring in a bottom to top manner to keep the curds moving. This should continue for the next 10 minutes while you see more whey being released. These curds are quite fragile so go slow but do not allow them to clump together. The next step is to raise the temperature slowly to 95F over 30 minutes and then again to 102-104F in another 30 minutes. 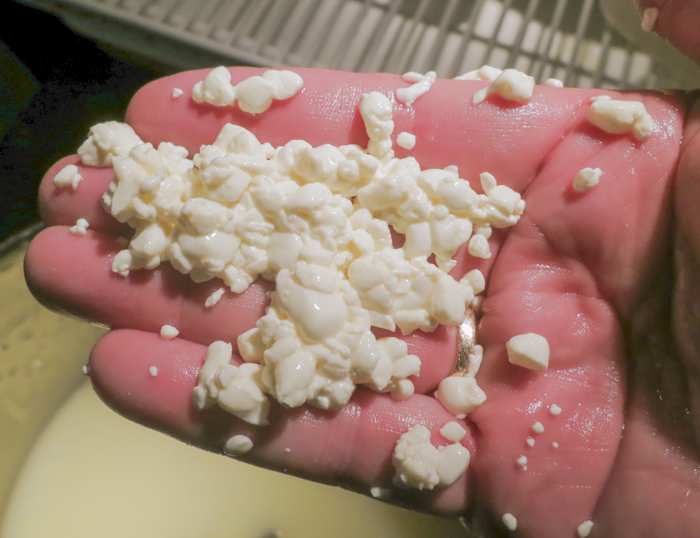 Once you reach this point it is time to examine the curds for their moisture level. This is one of the most subjective things in cheese making. 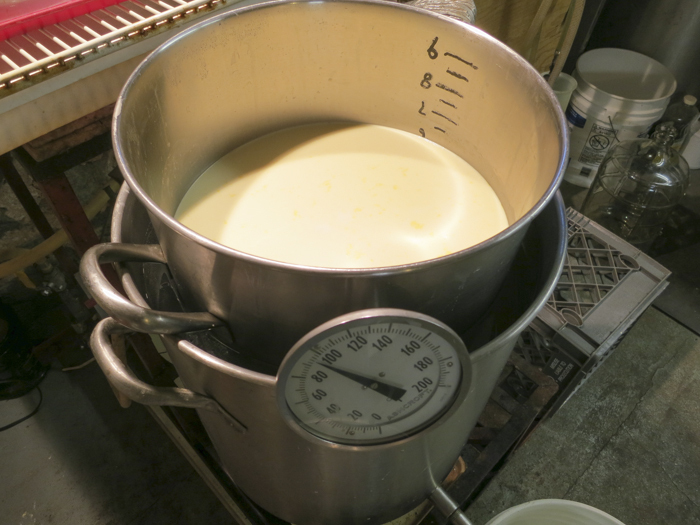 A lot depends on how much moisture you want in your final curds. 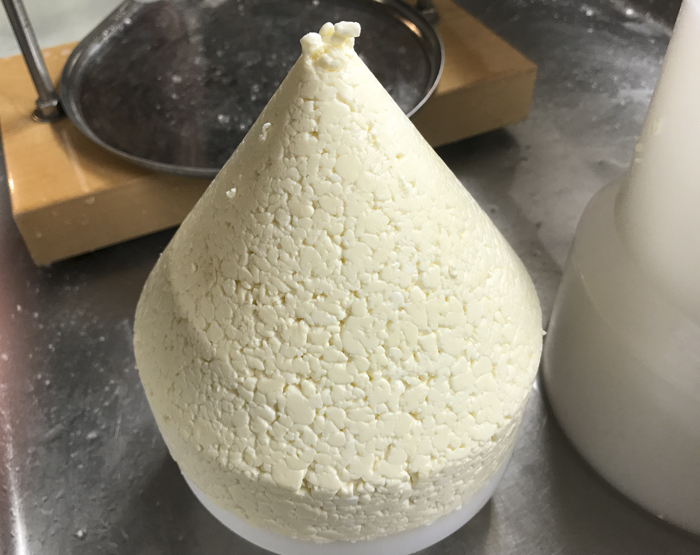 This cheese is fairly high moisture but if too much moisture it may cause problems in aging and if not enough moisture may be a very dry cheese and be hard to consolidate in the forms. 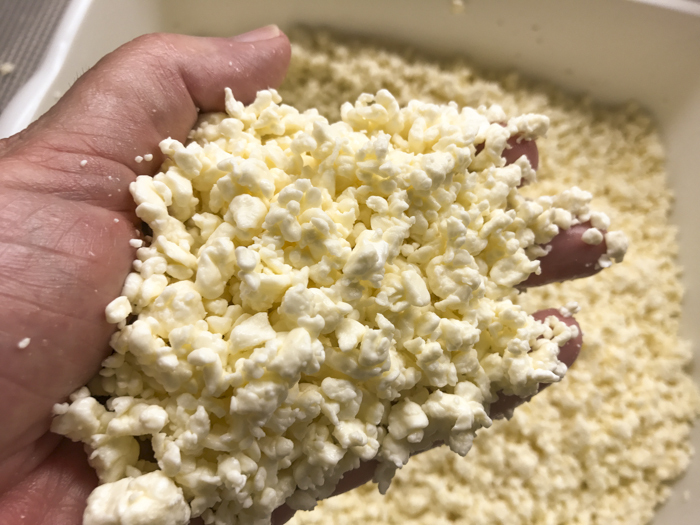 Examine the curds by taking a few individual curds and breaking them open... if they are very squishy and soft inside they need more stirring to release more moisture. Next collect a small hand full and press together lightly in the hand to consolidate, then see how easily they come apart. If they release with little effort they are likely dry enough. continue to stir slowly if the curds seemed too moist and squishy. This will cause more moisture to be released while the acid continues to develop. Higher fat milks and larger cuts may need this allow the curds to fall to the bottom and only give them enough of a stir to keep them separate every 7-10 minutes. This will keep them from becoming too dry. This is what is called pitching it limits the moisture loss but allows acid development to continue. In the end you should have an ideal curd moisture at the same time it reaches the correct acidity (which will be a bit lower than some other pressed cheeses). You should check the curds again when finished and if they still seem too moist, you may need to stir for another 10-20 minutes. If too dry you may have problems in consolidating the final cheese but next time remember to cut a little bigger or perhaps slower stirring. Now after all of this your curd will still be quite sweet still. IF you have a pH meter you can trust it should be about 6.0pH. If you don't have one just taste the curds. I rarely use my pH meter unless I am looking to set up a target profile for the first few makes of a new cheese or something doesn't seem quite right (its the GEEK in me). 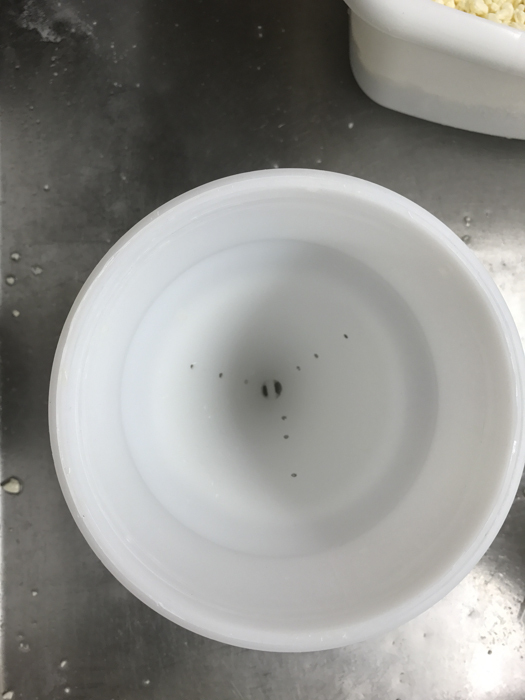 At this point the bacteria have been working slowly mostly due to the lighter addition and the slow ramping of temperature. We are now to take this acid development and slow it even more. by adding cool water to lower the curds enough to cause the bacteria to slow down even more. 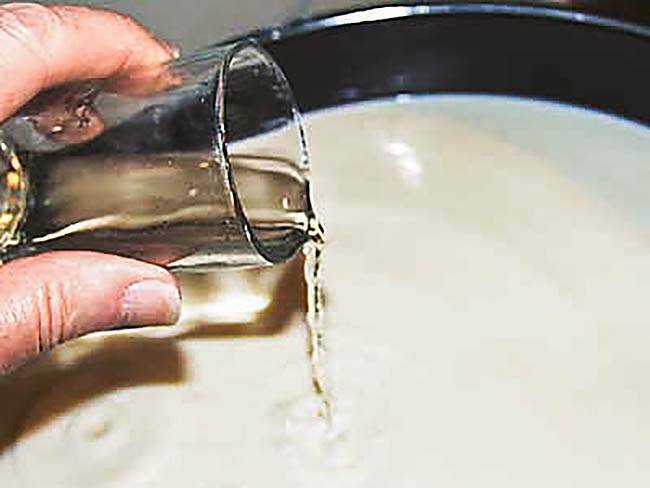 Remove about 1/3 of the original milk volume as whey. 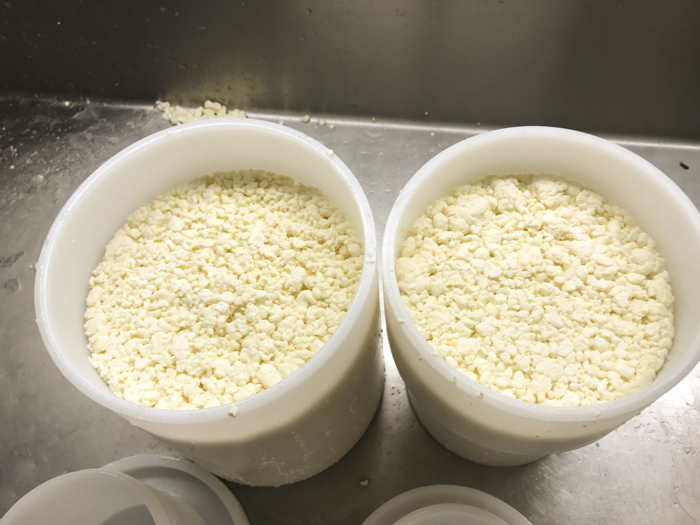 The whey should show about 1 inch above the curd bed. Stir this cool water wash for about 10-15 minutes until the temperature is stable. Drain to the surface with another 10 minute stir. For this phase I use a food grade plastic pan with holes punched in it with a hot nail for the drainer and a similar intact pan to hold the wash water in.. You could easily use a colander inside a larger pot for this as well. 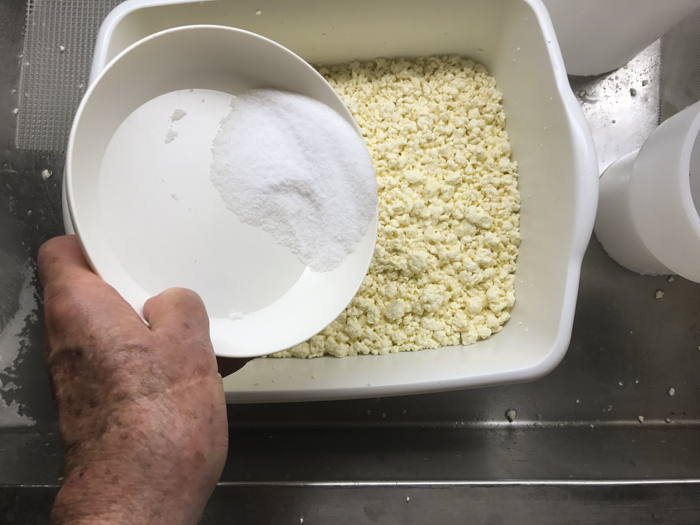 The final acidity will develop later on, if you taste the curds now you will note just the slightest of sweetness. You can now salt your cheese. I find that my yield is about 2.25-2.5lbs per 2 gallons. I normally add about 2% by final press weight of salt to the curds so for a 2 gallon batch about .75 oz. of medium grain salt. 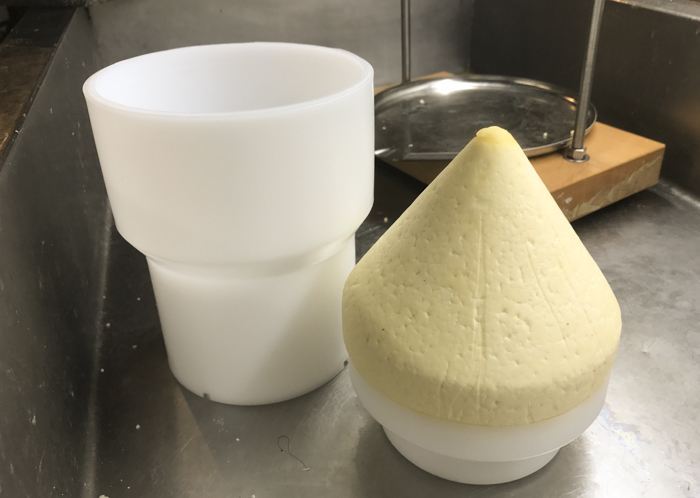 The cheese mold we use here is an inverted cone which tapers to straight sides and holds about enough curd for a one Kilogram cheese (2.2 lbs). The follower edges are curved in slightly so as to round off the bottom of the finished cheese. Use cheese cloth in the mold and the weight will be quite light for this moist cheese. The rate of whey running off is simply a matter of drops and not a stream of whey being released. This is a good rate of whey removal during pressing and will slow even more as the residual free moisture is released. The form should show tears of whey weeping from the form very slowly. When this stops you can increase the weight slightly. The cheese should be removed from the press, unwrapped, turned, rewrapped, and put back to the press at the above intervals. To assure an even consolidation. At each turn you will notice the cheese has formed a smoother surface and rests lower in the mold. Note: If your worried about not having the right cheese mold, the basic shape can be done in cloth. 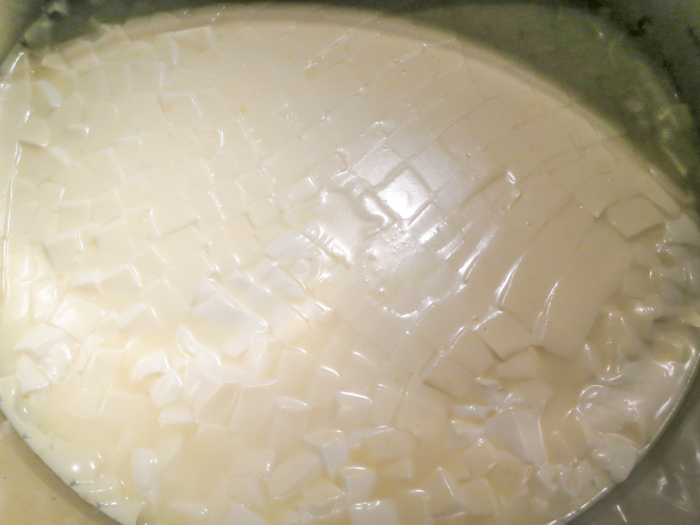 Simply hang the curds to form a tear drop shape. Then the final cheese will slump slightly into its own free form shape. If they totally collapse on taking the cloth off just dry the curd a little more. The cheese can now be waxed for aging. For details on waxing the details are here. However for this one I prefer to dry it over a couple of days then wipe with a light brine before adding a layer of smoked Paprika and oil. For the drying phase I put it in my drying space at about 60-65F and 65-70% moisture before going to the cave. I set it on a dry cloth during the drying to wick any residual moisture away. As soon as I see a darkening surface and perhaps a few white tufts of mold I know it is time for the rind treatment. I wipe the cheese well and then mix an oil and smoke paprika coating for the surface. This can then be rubbed onto the surface when needed. Any molds appearing can easily be wiped off with a cloth or brush between applications.. The cheese can now be aged for 4-6 weeks and mine was ready for the table. This recipe is for a cheese 'in the Style of' a cheese from the northwest corner of Spain where the mountains meet the sea, Galacia. 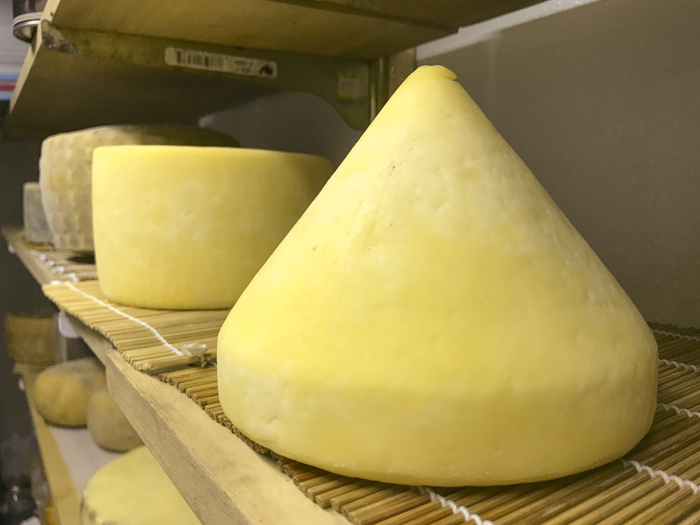 Surprisingly, cows milk cheese in Spain is not very common due to either the rough mountains or dry plateaus making up much of Spain's topography. The Tetilla cheese stood out due to its freshness and unique traditional shape of a flattened tear drop (not at all what the name means though). This is a wonderful high to medium moisture cheese with a buttery sweet flavor. Of course I had to add by own finish to it with a Smoked Paprika and Oil rub. This past year I spent most of May in Spain for my research on the traditional cheeses of Spain, inspired by the master of all Spanish cheese Enric Canut from Barcelona Spain. I had met Enric several years ago during one of his VIAC sessions in Vermont and he pointed out the diversity of Spanish cheese that had been held back (except for large productions like Manchego) by the Franco government in Spain for so many years and for the most part completely unknown to cheese lovers outside of the country. 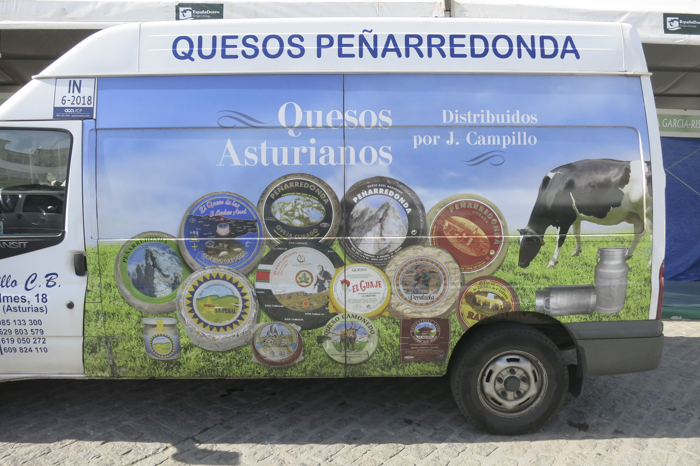 My initial focus was the 'Spanish National Cheese Festival' in Trujillo which is about 2 hours west of Madrid. While many of the cheeses were of a regional nature, there were many representations from throughout Spain and one that first caught my attention was the booth representing cheese from Galacia and surprisingly from cows milk (considering the dominance of goat and ewes milk cheese). 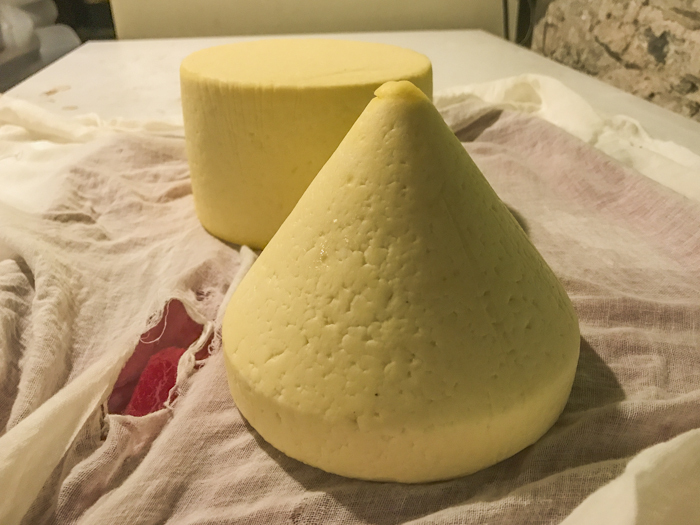 These were the cheeses 'Tetilla' and 'San Simeon', both of similar tear drop shapes. and the ones I am targeting this recipe. In Spain I found very few herds of cows. They seem mostly to be on the islands off the coast and in the wet pastures of Galacia in the north west. I have no idea where all of the milk comes from in the markets but Spain is primarily goat and sheep for cheese making. The smaller herds of sheep/goat really go back to the time the North African Moors held control in Spain and for a good part, their presence as far north as the Loire river in central France. They brought their herds into Spain soon after they settled there and as of today the animals are still there. The goat and sheep were particularly efficient at grazing in the arid lowlands as well as the rugged mountains of Spain. Galacia sits at the top of Spain in the north western corner where the mountains meet the sea. So, as expected, it is very lush with green pastures and hence perfect for the larger bovines. So it makes sense that one their most famous cheeses are from cows milk. 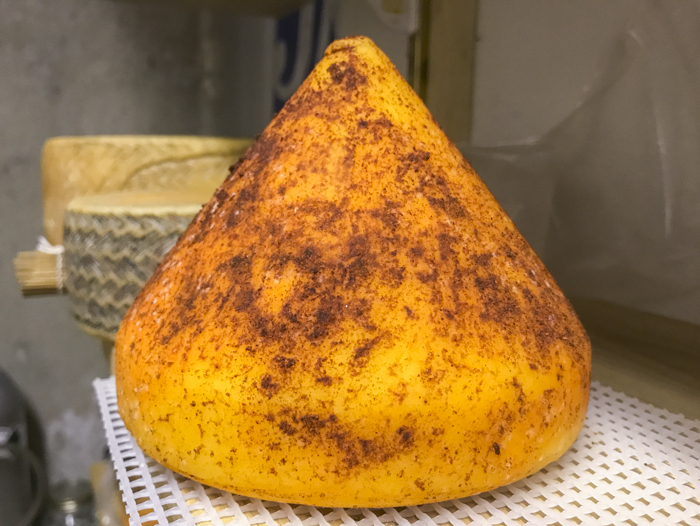 The cheese are unique in shape resembling a slightly deformed upside down cone and in the case of the 'Tetilla' with its flatter squished down profile, a small breast, hence the name. 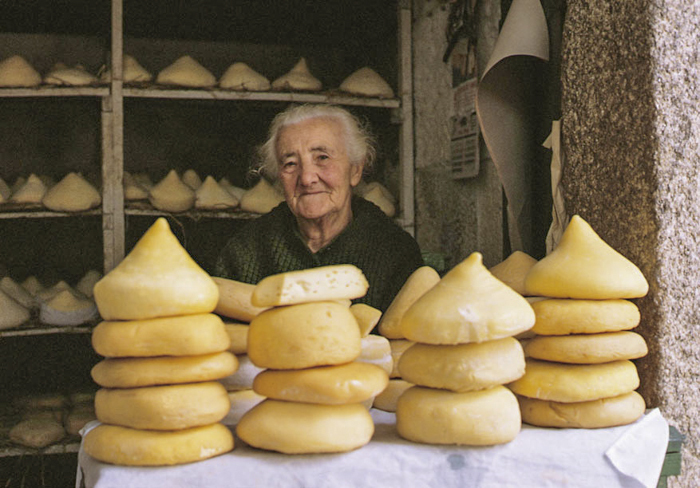 Traditionally these cheeses were drained in cloth bags that took on the tear drop shape as seen in the photo below right. Then due to their soft nature they flattened out and slumped into their shape, especially the Tetilla which was a bit higher moisture. In some cases these took on the shape of a flatish dome with very little shape. The moister they were though, the fresher they needed to be consumed. The traditional cheese were simply drained in cloth bags but quickly lost their shape for a more fun and organic shape. 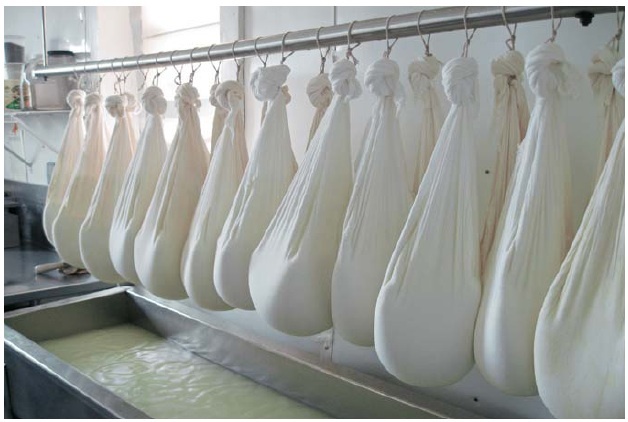 The cloth bags are what originally gave the cheese its shape as you can see in the tear drops shaped draining cheese. 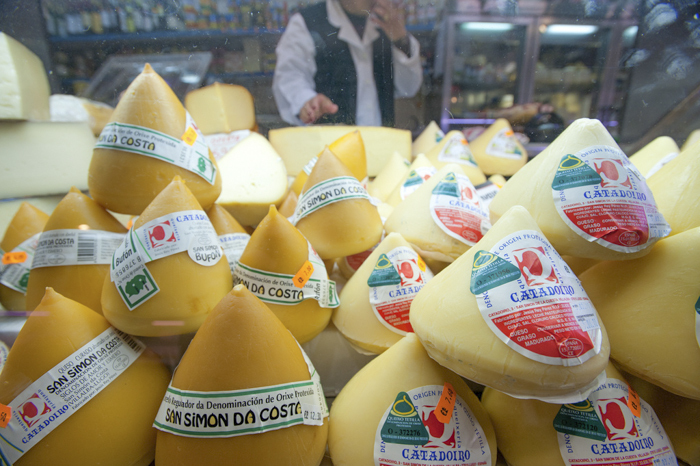 These cheese are typically made with a full fat milk from the region. They are quite soft and higher in moisture with a very fresh buttery flavor. The acid is also kept slightly lower with a long slow ferment. 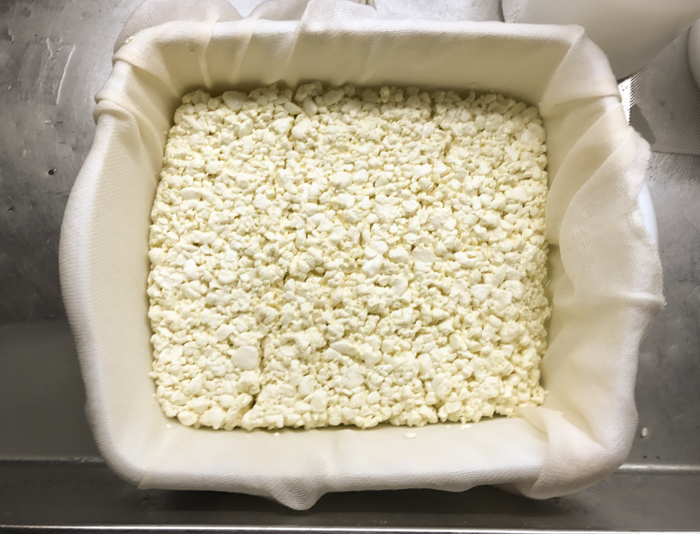 The final making has a substantial amount of whey removed and a cold water wash brings the temperature down even further while hydrating the curds. In the end the lower acidity allows the quality of the fresh milk to shine through for flavor. Sweet and buttery with a very supple character. 'Tetilla' tends to be a softer cheese and loses its shape as it sits. It is commercially finished off with a wax but traditionally served quite fresh and had a final hot water dip to toughen up its outside rind after coming out of the press (no wax) making them easier to keep mold free.